This one I kept for myself. Not a gift. Time shown ~2:50 Its uses a 90S2313 AVR μC, which both runs the dekatron, and pumps the FET, to make the +450V needed by the Sylvania 6476A dekatron. My standard features of DS1307 RTC, hourly chimes, and AC line sync’d time. Christmas gift to a good friend. It looks a lot like a South Park character, who always sees his demise at the end of each episode. Its the same circuit used for my 1st dekatron clock, but uses a Philips Z504S mini dekatron. The face is LED edge-lit laser engraved acrylic. The case, is from an old wooden pencil holder, with the opening made a bit wider. Firmware was upgraded to support the AVR tiny2313 μC, which superceded the 90S2313 chip. A present to my oldest brother for Christmas of 2006. Same basic features as all my one dekatron clocks, with a few extras. It uses an Atmel AVR mega8 μC, for the extra IO bits. These are needed to run two sets of LEDs edge-lighting the laser engraved face. A yellow set and a red set. Yellow indicates AM, and red indicates PM. 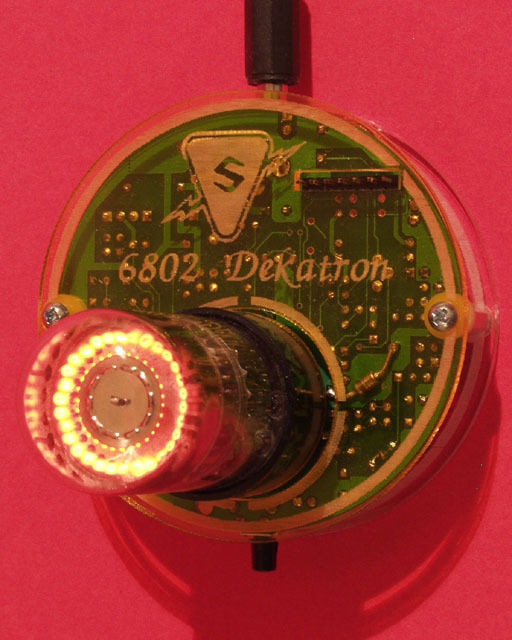 Sylvania 6476A dekatron used. Made this one dekatron clock as a present to a friend, for Christmas of 2009. Its the same circuit as the 1st two clocks, but I sent out to have PCBs made. So no hand wiring. Simply spins clockwise. Spin rate is determined by a neon relax oscillator. The pulse is boosted by the triode section of a 12BF6. A 12AL5 and the diode sections of the 12BF6 are used to get 450V (+150V & -300V) needed to power the dekatron. 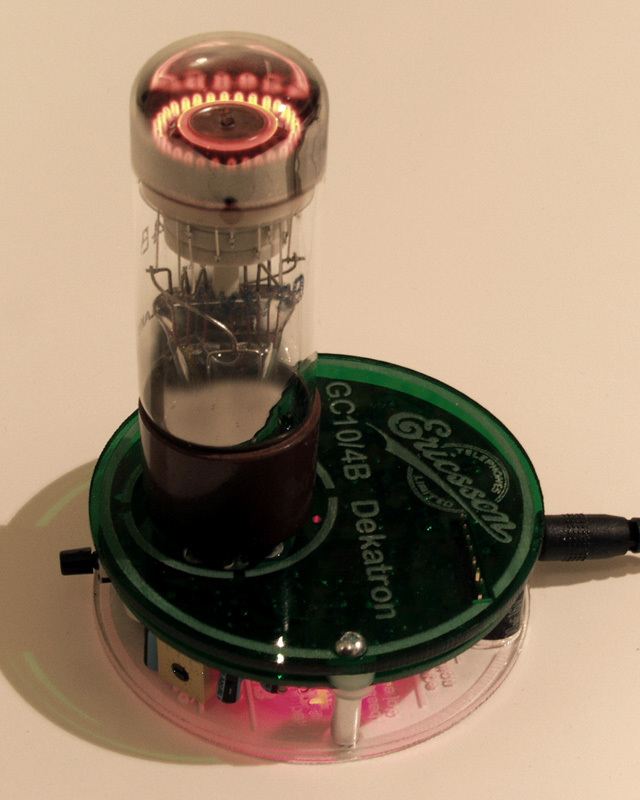 Dekatron do-hickies are μC driven circuits that make various, selectable glow patterns. Some even respond to ambient sound. Ericsson GC10/4B workhorse 2-guide neon dekatron. 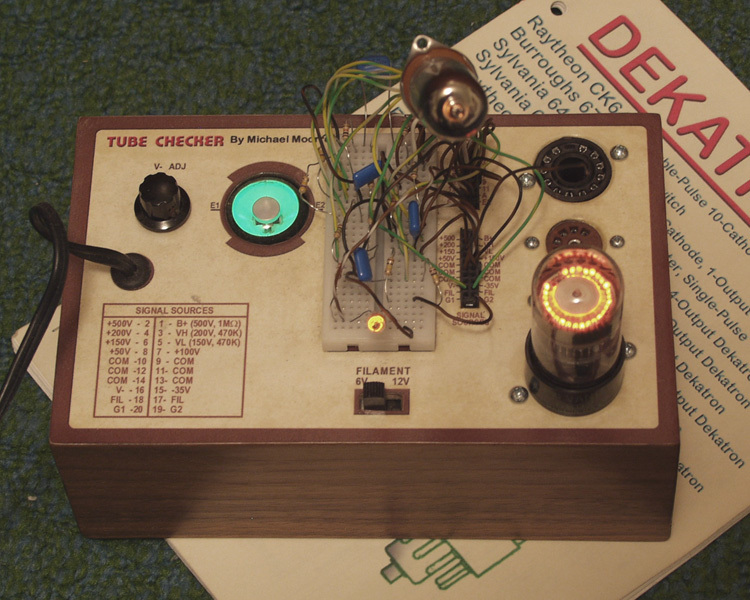 Originally intended as a tube checker/tester, you can also build simple circuits with it.